EDF Action has never before called for the dismissal of an administration official. But EPA Administrator Scott Pruitt’s record is so egregious, and so at odds with his sworn duties, we have no choice. He has shown no interest in protecting the environment. Instead, he has worked to derail more environmental safeguards in a shorter period of time than ever before in EPA’s 47-year history—all while spending close to $43,000 of taxpayer money to ensure nobody at EPA overhears his conversation with the President or the oil and gas industry executive he routinely hosts in his office. What is he hiding? We must bring all of Scott Pruitt's misdeeds out into the open—and hold him accountable. Join us today, and help us reach one million signatures calling on President Trump to dismiss Scott Pruitt! 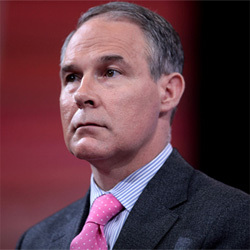 We the people find EPA Administrator Scott Pruitt in violation of his sworn oath to "Well and faithfully discharge the duties of the office upon which I am about to enter." We find that instead of discharging his duties as America's top environmental enforcement official, Mr. Pruitt has implemented a program to gut the EPA from within and slash funding for clean air, clean water, toxic waste, and other environmental safeguards. We find that he has disregarded the scientific findings of his own agency and, with little to no public input or debate, has proposed policies to block, delay, or weaken dozens of environmental safeguards. This reckless agenda has been pursued at a pace unprecedented in the 47-year history of the EPA, and has put millions of Americans at greater risk of environmental harm. We find that he has sidelined and silenced scientists and policy experts within his agency and replaced them with a cadre of lobbyists and public relations specialists who built their careers undermining the environment and advocating for special interests and polluters. We find that he has spent tens of thousands of taxpayer dollars on lavish trips home with no clear explanation of what his official duties are on these trips. We find he has operated in secrecy, not appearing regularly before congressional committees, not divulging his calendar of official duties, and spending close to $43,000 on a secure phone booth in his office to conduct business in the dark, even keeping his own staff out of the loop. We find that in these and other actions, Scott Pruitt is putting polluter interests ahead of the public good and is unfit for the office he holds. For these reasons, we call for Scott Pruitt's dismissal.